At the Open Compute Project Summit this week, Intel previewed their upcoming enterprise Optane SSD in the M.2 form factor, currently planned to be named the Optane SSD DC P4801X. Intel’s current Optane product family includes the flagship Optane SSD DC P4800X in U.2 and PCIe add-in card form factors, the consumer derivative Optane SSD 900P, and the consumer Optane Memory and Optane SSD 800P M.2 drives. The P4800X and 900P are physically big and power-hungry drives while the Optane Memory and 800P use a tiny controller, don’t fill the space available on a M.2 2280 card, and have very limited capacity. The limited performance and capacity of the Optane SSD 800P makes it a poor starting point for an enterprise Optane M.2 drive, but the controller on the P4800X and 900P is too large for an M.2 drive. 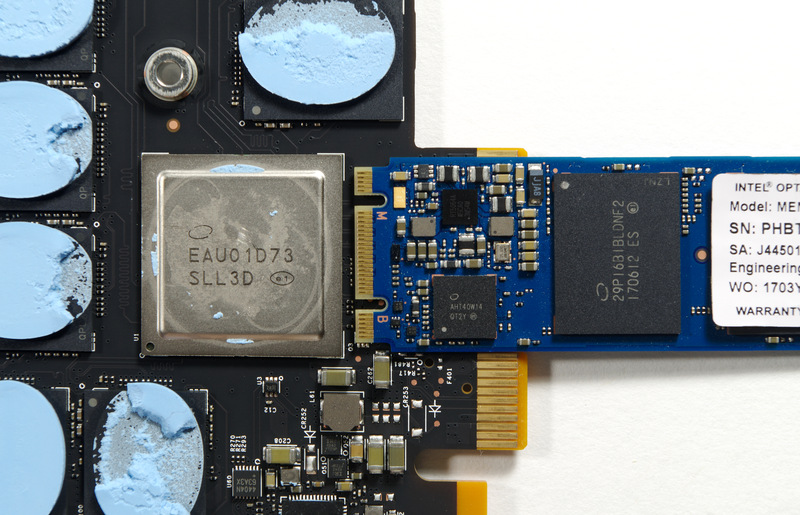 Intel has previously faced similar challenges with their flash-based enterprise NVMe SSDs being ill-suited for the M.2 form factor, but their second generation controllers produced the low-power SSD DC P4501. Intel has now managed to scale down the packaging of their high-end Optane SSD controller to also fit on a M.2 SSD. The controller on the P4801X uses the same 7-channel architecture as the P4800X and 900P, but peak performance will be lower due to the power and thermal constraints of M.2 drives. The samples at Intel’s booth were 375GB drives, matching the introductory capacity of the P4800X by using seven quad-die packages of 3D XPoint memory, where the first P4800X used 28 single-die packages spread across both sides of the half-height half-length add-in card. This was not a full product announcement, so Intel has not released any performance or power specifications. The OCP Summit is an event focused entirely on datacenter products, so no consumer counterpart was discussed, but it is clear that Intel can easily release a consumer version. This can address the gap between the 118GB Optane SSD 800P M.2 SSD and the 280GB 900P that is only available in U.2 or add-in card form factors.